I was thinking that it's been awhile since I did a Distill Wars Episode so I went ahead and raised it from the dead. 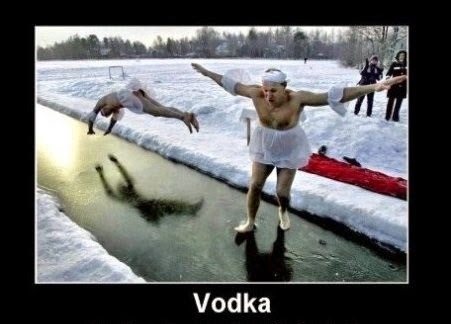 This time... it's VODKA! I usually stay away from vodka mostly because of things like the example pictured above: It'll mess you up. And also it's just filtered ethyl alcohol (with some water, sweeteners and numerous chemicals added that they don't want you to know about). 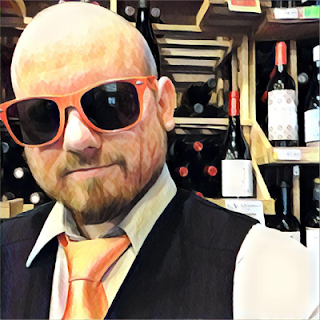 I would love to get my hands on a copy of Vodka Enthusiast to see what the hell a vodka drinker thinks is so great about it. Ya know, other than it will mess you up. Maybe I'll learn something tonight. So here we go... I bought myself a nip of Absolut Vodka ($2.25) and a nip of Tito's Handmade Vodka ($1.79). Who will be crowned the winner? Right from the get-go Sweden's Absolut has the advantage just because vodka in Europe is allowed to have a trace amount of congeners to differentiate brands from its competition. Tito's is from Texas, and American vodka is supposed to have no characteristics whatsoever other than ethynol. 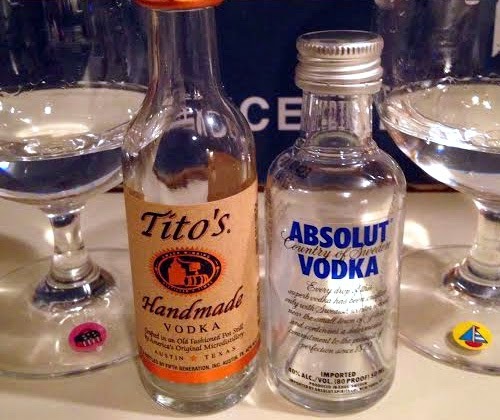 However... Tito's is from 100% corn while Absolut is from winter wheat. Quality alcohol from corn is sweeter and more delicate than those from other grains. Tito's is also made in small batches by pot still while Absolut is made in enormous continuous column stills. So Tito's has a fighting chance! USA! USA! USA! I put stickers on the glasses so I don't get them mixed up. Tito's has a lunchox with an American Flag design. Absolut has a sailboat because it's the closest thing to a Viking longship that my daughter's Hello Kitty sticker pack offers. Obviously the two are visually identical, but Tito's seems to leave the bigger legs when swirled. They're both 40% alcohol by volume (80 PROOF). Absolut's nose has a fantastic berry aroma. Tito's nose has aromas of lime and tonic. The volatile alcohol is harsher on the nostrils with the Tito's, while it's more reserved with the Absolut. Absolut is bitter and unpleasant in the mouth. It has flavors of burning plastic and saffron. It then goes ahead and finishes with orange peel and intense heat. Tito's is more acidic but the body is rounder, fuller and it goes down smoothly. It's very limey and a little grapefruity. The flavor of buttered sweet corn makes its appearance on a thick, smooth finish. There's much less alcohol burn but the acidity causes salivation after swallowing. So the final analysis of Absolut is that it has a better aroma than Tito's. It's really quite an enticing nose. Absolut's flavor has more to offer fancy mixed drinks because it'll make its presence more known than Tito's could. You know what? After this experiment I think that I could actually understand vodka if I wanted to. If I wanted to. I use to be a Stoli girl. Man I would knock you over if you blocked my path. But once I was introduced to Tito's there is no going back. I love that stuff! !